Announcement ANNOUNCEMENT: Recent release of 24 new images in December 2018. Stay tuned for more in 2019! It is the Year of the Earth Pig. I was born under that Chinese Zodiac sign. So I am excited to see what the year will bring. I know that I will be making some planner stamps, especially bullet journal stamps. Since that has become my new obsession. I have plenty to share soon! I would like to express my warmest ALOHA and MAHALO to all of my customers that have been supportive and inspiring me to continue to "doodle." So that I can continue to share and pass out "smiles" with these creations through my digital art. I truly enjoy each and everyone's work that you so freely share with me through our FB page, IG page and in person. https://www.facebook.com/kittybeedesigns Don't ever stop! Until then...take care of each other but most importantly yourself. ANNOUNCEMENT: Recent release of 24 new images in December 2018. Stay tuned for more in 2019! It is the Year of the Earth Pig. I was born under that Chinese Zodiac sign. So I am excited to see what the year will bring. I know that I will be making some planner stamps, especially bullet journal stamps. Since that has become my new obsession. I have plenty to share soon! All items were as listed. Fast shipping, will buy again! Thank you! Thank you so much for another perfect transaction. The stamp is so cute! Also, thank you for the extra bonus item! This is the cutest stamp set! The panda and the dog are two separate stamps. The dog will fit perfectly in the small boxes of my monthly calendar. Cute stamp. Thanks for the extra stickers! Here in Hawaii, its all about living with Aloha :) We enjoy seeing smiles and hearing giggles and hope that these images add that extra "pick me up" feeling. :) Please come by often and will be adding more clear stamps for you to create your works of art. We are small up and coming clear stamp company here on the beautiful island of Oahu, in the middle of the sea. 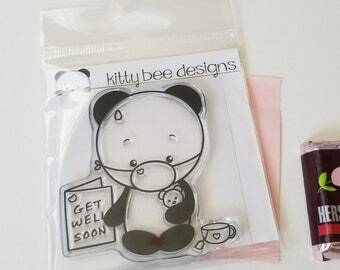 Mahalo for your purchase from us at Kitty Bee Designs. These pieces of original artwork is COPYRIGHTED and OWNED by Kitty Bee Designs which I reserve all the rights. 1. This is for PERSONAL USE only. You CANNOT sell this design. And you are NOT allowed to use this as a business logo or any marketing materials. 2. YOU CAN ADD TEXTS/WORDS. You can resize it to fit on your planner or craft projects. But you CANNOT alter or edit the original artwork - don't alter or change the color of the illustration or die cuts. 3. DO NOT distribute or alter any digitals or illustrations by any means. Do not claim this as your own. DO NOT REMOVE my watermark on my die cuts. 4. I appreciate image credit when posting the printed artwork on your social media. 5. I do offer a COMMERCIAL LICENSING AGREEMENT for my images, if you want to reprint, sell and distribute on your products for reselling purposes. Please inquire respectfully. I NO LONGER EXTEND AN ANGEL POLICY. All of my digital, clear or rubber stamps designs are copyrighted. (Kitty Bee Designs © 2018). Each one of these illustrations is hand drawn by Ruth Johnson. You must not reproduce our images by any means including but not limited to mechanical, electronic or photocopying methods as this would be in breach of our copyright. No sharing please! You may not resale images as digital files, or colored clip art, or use them as graphics on websites. These designs are not to used as embroidery, stitching, jewelry, wood products, metal or patterns for monetary gain. Unless you purchased a COMMERCIAL LICENSE AGREEMENT with Kitty Bee Designs, RuthJ_Designs 808 or Ruth Johnson herself. These designs are strictly for paper art projects. You are purchasing THE RIGHT to use my digital designs/illustrations for your PERSONAL use. You are NOT buying the illustration/design, just paying for permission to use it on a personal basis. By purchasing digital images found on this website, you are granted a limited license for personal use ONLY of these images. Do not redistribute (emailing, sharing, copying, duplicating or reselling) any of Kitty Bee Designs or Rianna & Me or Ruth Johnson’s digital designs and illustrations. ** Black and white line versions of my designs/illustrations (print outs), whether digital or printed or hand-stamped may ABSOLUTELY NOT be sold in kits, without my permission. NOTE: All of my digital designs available here in my Etsy store are ONLY available as digital format and are NOT available as rubber stamps at this time. Due to the nature of it being a digital file, once it's been paid for and the file is sent. I will not offer a refund. All sales are final. I use Paypal and we don't see your personal information. So its perfectly safe :) We do accept money orders and cashier's checks too. Please contact us if you have any questions. We will work with you. We will not ship your order until payment is received. We use USPS. We ship at cost, so if you over pay, we will refund you immediately after the order is shipped and on its way. Larger orders, we will ship it by Priority Flat Rate. If you want insurance please let us know, and it will be an extra charge. We ship at least 1 week or sooner, after payment has been received. If it lands on a Sunday or a holiday we will send it on the next business day. If you have a concern, please do contact us so we can work with you.